People's consciousness is in nobody's interest. The peoples of Bosnia and Herzegovina won't be allowed to move too much past 1992, because that's exactly where the foreign interests want them, close to the trigger. 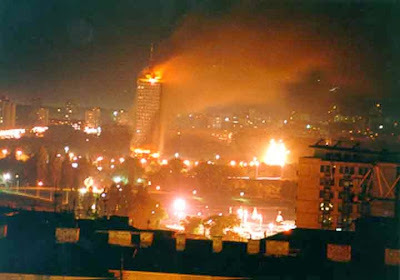 The 6th April is also the anniversary of the Nazi attack against Yugoslavia in 1941 and this is not an accident. Meanwhile NATO is busy to turn Syria into a 2nd Bosnia and the mainstream media is in full propaganda mode again. This is thier twisted way to honor this anniversary. "Christians being targeted by armed Islamist gangs"
"Militant armed Islamists - says the note - have managed to expel 90% of Christians in Homs and confiscated their homes by force. According to Orthodox Metropolitan sources, the militants went door to door in the neighborhoods of Hamidiya and Bustan al-Diwan, forcing Christians to flee"
"The situation in the field seems to resemble Sarajevo, or Srebrenica." Kosovo PM Thaci addressing CSIS in the US on the 5th April.